Private villa with adjacent guest cottages set in manicured grounds. Can Colom provides a fantastic base from where to explore the picturesque north of Mallorca.Ideally suited for one large family group,two families or four couples. Can Colom offers guests an opportunity to relax in beautiful surroundings and enjoy a holiday together but with a sense of independence which has been cleverley created by the owner . Set in the stunning Vale de Colonia Can Colom has an unrivalled backdrop of the northern mountain range to its rear and of the towering Puig de Maria from the front aspect and garden. At the top of the Puig de Maria there is an old monastery and a fantastic restaurant serving traditional dishes prepared from freshly sourced local ingredients. Accommodation at Can Colom is offered across the main house and the adjacent guest cottage - La Casita with a total of five bedrooms and four bathrooms. The garden room alongside the cottage completes the accommodation offer. The main house at Can Colom offers a master bedroom with large double bed and an ensuite ,a twin bedroom,bathroom,kitchen and lounge. All items have been considered in preparing the villa for modern day living including wifi,flatscreen TVs and Bose sound systems. Our cottage offers a large double bedroom with shared toilet facilities.The adjoining room can be interconnected for families with younger children or used independently for total privacy.The spacious twin bedded room has a flatscreen .The Garden room has a double bed with walk in wetroom,flatscreen TV and "mood" lighting. The cottage boasts an fully equipped outdoor kitchen where our guests may BBQ,prepare pizza in our wood fired oven or even cook chicken tandoori in our specially imported tandoor.The cottage terrace has a plunge pool which is fantastic for dipping in and out of or star gazing late at night. The hub of your social activity is likely to be around the al fresco dining terraces and swimming pool.The garden and pool is in full view of the terraces so the property is very child friendly with children easily supervised or monitored. Located one minutes drive to Pollensa,ten minutes gets you to the turquoise waters of Cala san Vicente and 15 minutes to the resort of Port Pollensa.Your base is very central to a wide range of local activity. Having lived on the island for 12 years I have designed and overseen the refurbishment from the beginning of the restoration. The social areas of the property are perfect for outdoor living whether it be poolside or enjoying a unique "al fesco" expericence which has been created for guests of Can Colom. Bathroom one-ensuite to master bedroom has a shower, wc , basin and heated towel rail. Bathroom 2 - has a full length bath with overhead shower, wc, basin and heated towel rail. Both bathrooms are tiled with porcelaine tiles, high quality furnishing. The spacious lounge is the hub of activities during your holiday. Fitted with high quality furnishings and offering Sky TV, DVD. and WiFi internet throughout. During winter the wood burner and central heating make it very comfortable. The kitchen has an eye level oven, microwave, fridge/freezer induction hob and ample cupboard space. There is a dining table with a capacity for eight persons. Golf Pollenca is a two minute drive away. However there is a far more challenging course at Alcanada Golf Club, Alcudia. This course is superbly located overlooking Alcanada Island. It has 18 holes and the restaurant at the Club is outstanding. A gorgeous Villa with flexible accommodation close to Pollensa town. Can Colom is a really pretty ‘boutique’ villa situated in a perfect spot close to the port of Pollensa and the old town itself. We are a family of four with two teenagers who each brought a friend. We also took grandparents. The house itself has two bedrooms and across the garden is a separate self contained cottage plus a garden room with a wet room. The house being the owner’s home is well equipped, delightfully homely and the gardens are extremely pretty. There is space to park and a fabulous amount of lawn. Martyn, the owner and possibly even a ‘super host’ is extremely helpful and welcoming. He could not have done enough to ensure we had most wonderful stay. A gorgeous place to stay which we recommend highly. Thank you very much for this lovely commentary . As you know we’ve worked very hard to create a home from home experience for our valued guests at Can Colom . Great quiet location close to the mountains and not far from shopping and restaurants in Port Pollenca. The house is great for large families or two families travelling together, because of the main house and the two cottages. The garden is perfect with lots of space, a nice pool, barbecue, outdoor kithen and activities for the entire family. The garden lacks areas with shade during the warm days of summer. There was only one parasol. The house and cottage are rather small, and there is only AC in the bedrooms. This means that in the kitchen/dining room and in the living room it gets very warm during summer. The house lacks new, thick towels for bathrooms and pool. In response - the towels at the guest cottage have been upgraded to the same quality as the main house.I did realise that they were a little small but had to wait for delivery of exactly the same make and size as the rest of the property.There is AC in both bedrooms and the lounge of the guest cottage. There never has been AC in the lounge of the main house as it is very open with a constant breeze.I have never had this commented upon before but it is something that possibly could be added for next season. What a lovely stay. Martyn, the host, was very helpful. The Villa is fantastic, the pool heating was just perfect. will definitely tell everyone about this one. Thank you Carl - Im glad that you enjoyed your stay at Can Colom. The Villa is exactly as advertised and more. Exceptionally clean both inside and out. It's in a great quiet location with stunning surroundings, This villa was perfect in every way. Finished to an exceptional standard and with everything you could need for a wonderful family holiday. 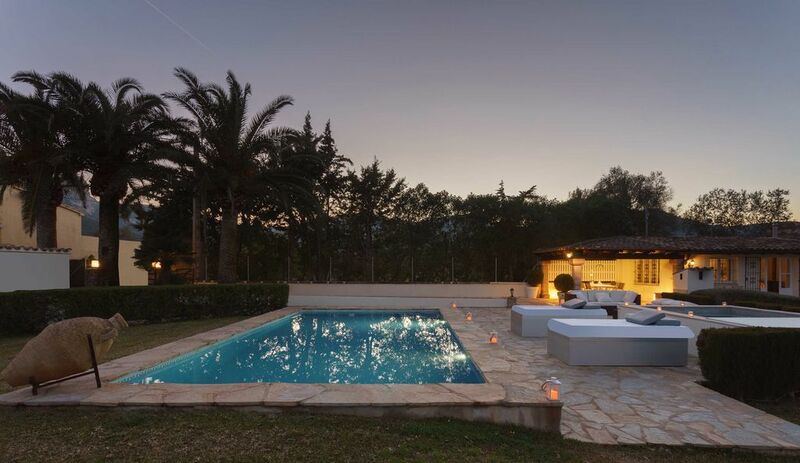 The pool and Jacuzzi were fantastic, The villa itself was in a great quiet location among other detached villas and a short drive to the charming historic town of Pollenca. Communication with Martyn the owner was a pleasure and nothing was a problem. Would definitely stay again and recommend to others! Perfect property for a family of 4. Near Pollenca (5 min drive) and within easy reach of 2 big supermarkets, and less than 10 minutes from the motorway. The best thing is the outside space - a real suntrap until 8.30pm with plenty of places to sit - the big daybed is perfect for relaxing with a book and a glass of Mallorcan rose!. The 2 pools are clean and safe - the children loved going in the larger pool with their pool toys and then hopping into the heated spa pool, which was ideal for a late evening dip with another glass of wine!. There is a large grassed area for children to play football and there are gates to shut for extra peace of mind if you feel the need. The owner lives next door and is helpful, with plenty of suggestions as to where to eat. The property is clean with a modern interior and full facilities including English TV. We would certainly recommend this property to others. Verspricht leider nicht das was dargestellt wird. Tolle Bilder, aber leider sind 70% der Unterkunft nicht bewohnbar. Unglaublich muffiger Geruch und es ist überall feucht in der gesamten Unterkunft. 2 der 3 Einzelgebäude ( beinhaltet die 2.küche, das 3. und 4. Schlafzimmer, das 2. Wohnzimmer und das 3. und 4. Badezimmer ) sind nicht bewohnbar. Ameisenbefall überall wo man hinsieht. Der Pool war nicht beheizt. Der Whirlpool war defekt. Heizung ging nicht. Von der sowieso schlechten Beleuchtung waren auch noch einige defekt. Fazit: Bei dem Preis ist das Objekt nicht zu empfehlen. Wir haben Schadenersatz angefordert und sind gespannt. In response - this client has his own rental property in Germany.He went out of his way to leave publicity in the most curious of places but all were recovered by our domestic team. I have owned and rented this property for 12 years and have never received negative reviews.This is mainly due to the fact that during winter it is our home and subsequently is kept in a very good condition throughout the year. The guests elder daughter did not wish to stay in the guesthouse as she wanted to be with her sisters.The bed was moved from the guesthouse to accommodate this. The comments are totally incorrect regarding the property being damp.During this guests stay we did experience incredible rainfall so the land was very wet but of no fault of the property! The Jacuzzi worked perfectly but like the pool it wasn't heated as pool heating is an optional extra which this guest did not request. In summary its understandable tat this guest didn't have a very nice experience of a Mallorcan holiday as it rained almost every other day. In his original comment the the agency he said that he failed to communicate with ourselves as we didn't speak German!However I spoke to the guests wife on 5/6 occasions in English so there was no breakdown in communication either.It is just another lie. I have now taken legal advice due to the extend of lies which could prove damaging in the future. The area is very popular with Cyclists, Walkers and Climbers. Cala Saint Vicente is approx 12 minutes drive from the property. Port Pollenca is approx 15 minutes. By far the best beach in the area is at Playa de Muro. This is about 20 minutes by car but will be the best 20 minutes you will ever spend driving. The beach is superb with a constant surf when there is a Northerly breeze sweeping into the bay. There are several beachside eateries all of which are of the highest quality,serving freshly line caught fish on a daily basis. We furnish guests with directions from Palma Airport and a detailed map of the area to locate Can Colom. Pollenca has several banks, a quality deli, traditional fishmongers, butchers and bakeries. There are several supermarkets in Pollensa and Port de Pollensa aswell as two quality deli´s. Pollensa has resturants to suit all budgets as does Port de Pollensa. Pollenca town is a place of great cultural interest. There are several galleries, churches and interesting architecture. The Calvary Steps lead to a lovely church at the summit. The Cloisters Arts Centre provides chamber music and is popular with travelling music companies. There is a Sports Centre and a Gym in the centre of town. At near-by Port Pollenca there are squash courts and indoor swimming pool. Karting is a popular pastime with visitors. There is a fantastic track with "real" carts at Can Piqafort. If it's water activities you're after then there are all sorts in the area. These range from the Aquapark in Alcudia to boat rentals in Port Pollenca (speak to our guest services) and Catarmaran trips on board Robinson boat in Port Pollenca. Palma is an amazing City. It is an easy 50 minute drive from Can Colom. The Cathedral is a major tourist attraction not to mention the shopping at Jaime Tres. From Palma you can travel to Soller by train. The route takes you through the orange groves the scent of which is amazing as you hurtle North. On arrival in Soller you can enjoy the town and its pavement cafes before boarding the tram that takes you to the Port of Soller. Here you can relax on the beach or around the harbourside. Mallorca is famous for its fiestas - further info available upon request at the time of bookming as there are far to many to mention. August is the largest of all fiestas . "Patrona" attracts people from all over the island and lasts the whole weekend.Many of our repeat guests visit during this fantastic festival. Booking Notes: We request a 25% deposit with the balance falling due six weeks prior to your arrival. We are able to offer our valued guests a Car Hire Booking facility as well as the pre arrival shopping service mentioned earlier. Changeover Day: Changeover days are a Saturday. Arrivals after 4pm. Departures 11am. There is flexibility during Winter. Also during Winter the minimum stay is 4 nights. Should departing guests have a late flight home we allow luggage to be left with us untill 3pm . Notes on prices: Low Season Discounts available - March 1st - April 1st (Ex Easter), October 6th - 10th November.